James Franco stars in THE DISASTER ARTIST. ©A24. CR: Justina Mintz. HOLLYWOOD—Anyone can make a bad movie, but it takes a special kind of filmmaker to cook up a memorable turkey. Hollywood is known to celebrate such dreamers. Tim Burton, for example, paid tribute to horrormeister Ed Wood, with a 1994 dramedy starring Johnny Depp. Now comes “The Disaster Artist, ” the big screen story of Tommy Wiseau, who financed, directed and starred in the 2003 clunker, “The Room.” Acclaimed actor/filmmaker James Franco steps into the shoes of Wiseau, whose film sank when it was released two decades ago, but has since become a cult classic and the mysterious Wiseau an unsung hero to film buffs. Franco co-stars alongside his younger brother, Dave, who plays Greg Sestero, Wiseau’s supportive friend and co-star. The humorous biopic also stars Seth Rogen, who plays “The Room’s” exasperated script supervisor, Sandy Schklair. 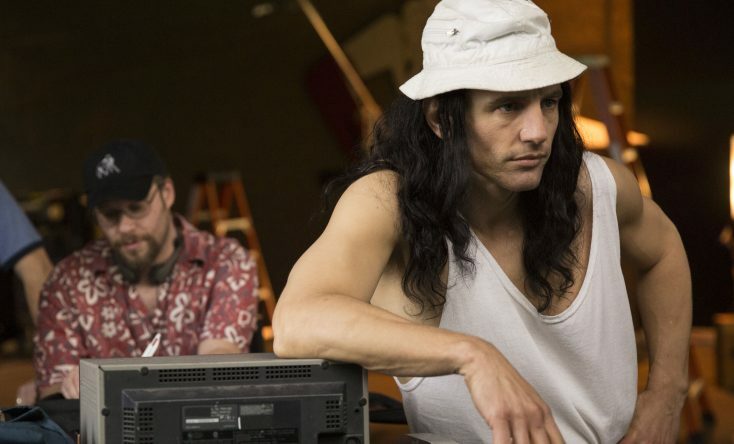 “The Disaster Artist” is based on Sestero and co-author Tom Bissell’s book about Wiseau and the making of the room, adapted for the screen by Scott Neustadter and Michael H. Weber. Franco, an Oscar nominee for his depiction of injured rock climber Aron Ralston in 2010’s “127 Hours,” spoke about making the biopic about the offbeat filmmaker, working with his brother and more. Q: What interested you about Tommy’s story? Franco: I mostly do the things, as bizarre as they are, because I’m interested in them. Certainly, with this movie I was attracted to the fact that this was a bizarre Hollywood story and that he was a character unlike any other human being on the planet. I also knew that underneath it was a very universal story, that it was about dreamers. I thought if we can get both of those elements in this movie we would have something interesting. Franco: I actually am probably the only human being who read the book first before I saw the movie. I was certainly aware of the billboard on Highland Avenue (in Hollywood). I had been living in L.A. since 1996 and the billboard was up for like five years in the early 2000’s and I saw it, but it just didn’t penetrate my consciousness. There was a phone number on it and I thought it was like a cult or something. Q: Did you call the number? Franco: No, I didn’t want to be in a cult. (He laughs.) Or I thought you’d call it and you’d hire this guy to be in your movie, like (self-promoter) Angelyne had those billboards. I was not interested. Whatever it was, I was not interested. Then I read the book and before I was halfway done I said, “This is such an amazing story,” and I went out and saw it. I was in Vancouver shooting “The Interview” with Seth (Rogen) at the time. It was an amazing screening and I was sold. Q: In a review of “The Room,” you wrote that Tommy Wiseau was searching for artistic integrity. Is that something you search for? Franco: Yeah, I wrote a review for Vice before I even had the rights to the story and the book. What I said in there was I respect Tommy so much, because how many thousands of people come to Hollywood to make it in the movie business, and not everyone does. He came here and he faced a mountain of “no’s” and then he did it anyway. He willed this movie into being. On the other hand, I believe the movie business is a collaborative medium and it works best when there is collaboration going on. Tommy had been burned so many times in his life that he just felt he could really only depend on himself and maybe his friend Greg. He didn’t listen to anyone, because he had learned that nobody was going to help him. Taking that attitude onto a set caused him to make a lot of bad decisions. If he could have just listened a little bit, maybe he would have learned it’s not a great idea to shoot 35mm and HD at the same time or build a set of an alleyway when you’ve got the actual thing right outside. At the end of the article I wrote, “Tommy Wiseau c’est moi,” because I do identify with him. He and I had the same heroes—James Dean and Marlon Brando. He and I went through all the acting classes. Many aspects of our stories are similar. It’s just that he has a weird self-perception. Q: Do you think he’s like “Sunset Boulevard’s” Norma Desmond? Franco: He’s very much like her. That film was a huge reference (for “The Disaster Artist”). Q: What was the nature of the relationship between Tommy and Greg? Franco: This is on some level a love story. It’s a bromance in the purest sense of the word. Tommy is definitely drawn to Greg, and a lot of what the film shows is Tommy acting out and misbehaving on set. It’s often a result of fearing that he’s going to lose his connection with Greg, and that was a very conscious choice to show that on our part. There is a very subtle sexual tension, but it’s very light on purpose. A, because Dave is my brother, and B, we felt like it’s a proper bromance in the sense that it’s not really a sexual love story. Tommy isn’t going about trying to be Greg’s lover, but there certainly is love underneath. Q: The movie ultimately honors Tommy, but during the course of the movie it of course makes fun of him in different ways. Franco: We weren’t really poking fun at all. We were really just showing everything, all the warts. Q: How did he respond during the process of making the movie? Franco: Tommy is a very interesting guy that works in unusual, unexpected ways. While we filmed the main part of it, he was not very involved at all. We used the book as a guide and for my own personal research, getting into the character, I had these recordings Tommy had made. He would drive around in his car 20 years ago, before “The Room” was made, and talk to himself on these mini cassette tape recorders. Greg had some of those tapes and gave them to me. Tommy knows that I have them. They were very valuable, because he was having very intimate, personal conversations with himself, so I could get into his head that way. But he just didn’t want to be involved (in making “The Disaster Artist”). All he really wanted was to have a scene in the movie. That was in his contract. Q: What was your first meeting like with him? I learned later that Tommy he was a huge James Dean fan and he had watched my rendition of James Dean (in the 2001 self-titled film) many times, and so he may have been secretly excited that I wanted to play him. Q: How much fun did you have playing Tommy? Franco: Tommy is so fun to play. He’s very infectious. The other actors will tell you that I stayed in character even when I was off-camera and directing them. That was for several reasons. Maybe the main reason is it was just fun to be that character, but also because it may be the only time in Hollywood history that somebody’s directed himself in a movie where he’s playing a character who’s directing a movie and acting in it as well. I can’t think of another case of that. It was just easier once I had the prosthetics and wig on to just be Tommy for the day. Q: How bizarre would it be if you get an Academy Award nomination for this? Franco: Very bizarre. When Tommy made “The Room,” he distributed it himself, and paid for the movie to be in theaters for two weeks to qualify for the Oscars. Ours will, hopefully, be out for more than two weeks, and I’m not paying for it. The fact that there’s even that kind of question being asked to me is so gratifying. It makes me smile that 14 years later, Tommy’s story is being talked about in that way. “The Disaster Artist” opens in some theaters Friday, Dec. 1, and expands nationwide Friday, Dec. 8.